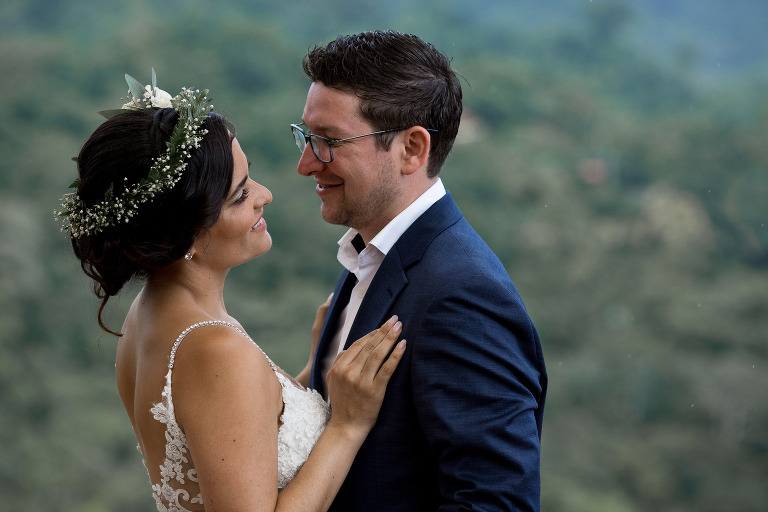 Ali and Ari decided Costa Rica was the perfect destination for their paradise wedding. The venue they chose, La Mariposa Hotel, provided excellent views for their ceremony. Plus, it’s a nice location to get a wide variety of photos. This amazing destination wedding was filled with lots of love from beginning to end. Check out the photos below to see the incredible location for this destination wedding! 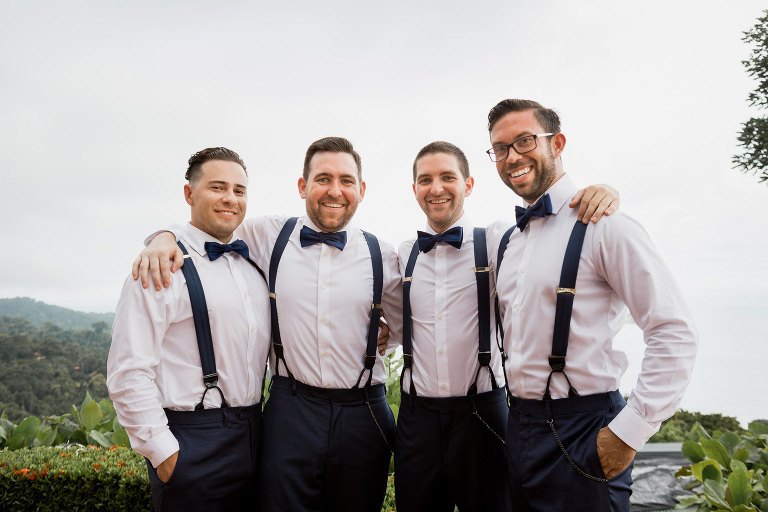 Pre-ceremony, the groom and groomsmen dressed in a room with spectacular ocean views. They laughed and joked and kept a very light-hearted and positive vibe. 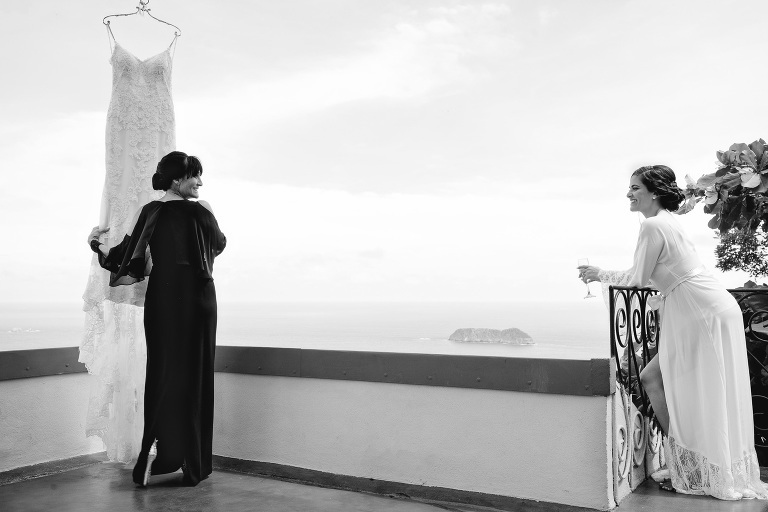 Meanwhile, the bride and her mother admired her beautiful wedding dress on a balcony overlooking Manuel Antonio beach. Ali looked stunning in her robe and even took the time to help the flower girls get ready. That morning she enjoyed a slow and relaxing time with her friends. 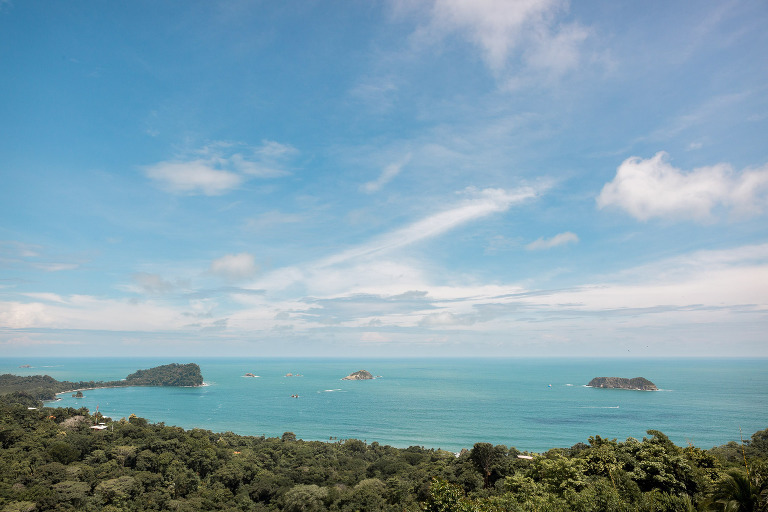 These types of mornings are very typical of destinations weddings in Costa Rica. She sipped champagne with her closest friends and lounged in custom robes until it was time to slip into her incredible dress. Once Ali slipped into her dress we snapped a few quick photos on the balcony before heading down the stairs to the reception site. Ali’s entrance was wonderful. All eyes were on her as she was escorted down the aisle. One of the most distinctive parts about La Mariposa paradise weddings is the large Almendro tree next to the infinity pool. It provides a nice shade for the wedding party and a beautiful backdrop in wedding photos. 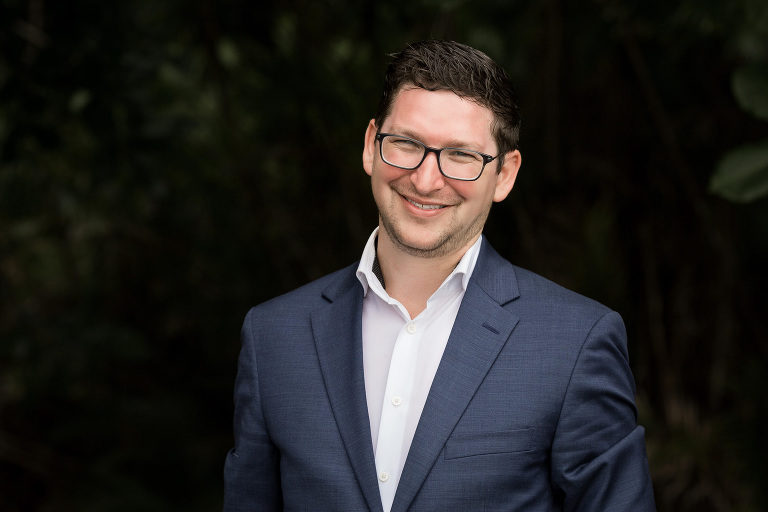 The ceremony was a blend of wedding traditions from Ari’s Jewish background and Ali’s Spanish background. This combination made the ceremony one of a kind. There were incredible moments of beauty, passion, and pure love. After the first kiss, the two exited and shared hugs and tears with their closest friends. Afterward, we headed to a nearby beach access point to snap a few quick photos in the sand before heading back to the hotel for the couple’s portrait shoot. We headed downstairs to the reception area once we had gotten some great photos and Ali and Ari had time to relax. At the reception, the couple shared their first dance as guests took photos and videos of the newly wed couple. Then, after a sweet first dance, Ali had a much more energetic dance with her father as he spun her around in the air. The party had officially started. Afterward, there was a break in the action for heartfelt speeches and an excellent dinner, before a return to the party. The night was filled with laughter, good music, and lots of dancing. All guests participated in the dancing, old and young. The patio overlooking the ocean was alive with energy. To see more photos of this amazing hotel be sure to check out this other gorgeous wedding that I shot here!